This is how much Tom Hiddleston got into playing Hank Williams in writer/director Marc Abraham’s I Saw the Light. When I tell Abraham that it’s possible I learned the Williams canon in utero, the country legend being a hero of my Arkansas-born father, Hiddleston interrupts. Pulling out his phone, he says he has something to play me. “I was listening to that this morning,” he says simply. Then there’s the matter of the hat. There’s a Stetson sitting on a table in the suite at San Francisco’s Fairmount Hotel that looks suspiciously like the one he wears in the film and on the movie poster. It’s not the real hat, he’s quick to say, just one the Sony Pictures Classics provided for the press tour. “The actual hat is sitting at home in Belsize Park, the hat I wore in the movie, the special hat,” he says. I Saw the Light is clearly an exceptional experience to the thoroughly British actor, 35, who utterly transforms himself to play a beloved son of the American South in the movie, and even more so to Abraham, a Louisville, KY native who grew up on country radio. Williams’ music and the tragic story of a brilliant, tortured songwriter who didn’t live to see 30 stayed with Abraham as he embarked on a career first as a television scriptwriter and then as a producer on such films as The Commitments, Spy Game, and Children of Men. Then several years ago, he heard that plans were in the works for a Hank Williams movie, and Abraham, who made his directing debut with the 2009 drama Flash of Genius, knew he had get moving on his own. The project was on track when he went to see Steven Spielberg’s 2011 WWI drama War Horse and spied Hiddleston in the role of Capt. Nicholls. “I turned to my wife and said, ‘That guy looks like Hank Williams.’ She said, ‘Shut up and watched the movie,” Abraham laughs. The filmmaker sent Hiddleston the script and Skype conversations about it turned into phone calls and eventually into discussing the movie over dinner. The actor’s star was rapidly rising with unforgettable roles in Woody Allen’s Midnight in Paris and Terence Davies’ The Deep Blue Sea, and as the mesmerizing villain Loki in Thor, but that didn’t mean he automatically had the part. Abraham had promised his casting director that he wouldn’t offer it to anyone without an audition first, since it is a technically difficult role. But then one night over a meal, caught up in the enthusiasm of their conversation, Abraham couldn’t help himself. “He was really enthusiastic about it,” Abraham says. “He said to me, ‘I really love this. I really think I could do it, but just promise me one thing. Promise me you’ll allow me the time to prepare before I do a reading.’ Just very generous, and assuming, of course, there would be a reading, because that’s the natural thing. Hiddleston admits he was only familiar with a handful of Williams’ songs before I Saw the Light came into his life, but he found the man he got to know initially through Abraham’s script fascinating. He wanted to tell that story. “I found the suggestion in Marc’s screenplay that the genius in his songwriting came from the turbulence of his intimate relationships a very incisive thesis, a very brilliant reading of his work,” Hiddleston says. It was also Hiddleston’s job to learn to sing like Hank Williams, right down to the yodeling that was his signature. Abraham likens the process of mastering Williams’ technique not to climbing Mount Everest, but to scaling the even more daunting K2. To help Hiddleston channel a genius, another was called in, singer-songwriter Rodney Crowell, who took Hiddleston into his Nashville home for several months to work on the actor’s vocal chops and record I Saw the Light’s soundtrack. ‘Rodney’s extraordinarily patient and wise, and we really sweated over it,” Hiddleston says. “We learned a lot about ourselves and each other. It was hard work, but it was joyful work. It was an extraordinary thing when we finished it, saying goodbye to each other, because we became very close. You do when you make music with people. When he was a kid, Hiddleston would stay through the end credits to find out who had made the music he loved in a movie. Then he would run out to HMV to buy the record. He remembers discovering The Ronettes that way when he heard “Be My Baby” at the beginning of Dirty Dancing. Now, for the first time, it’s his own name he sees. 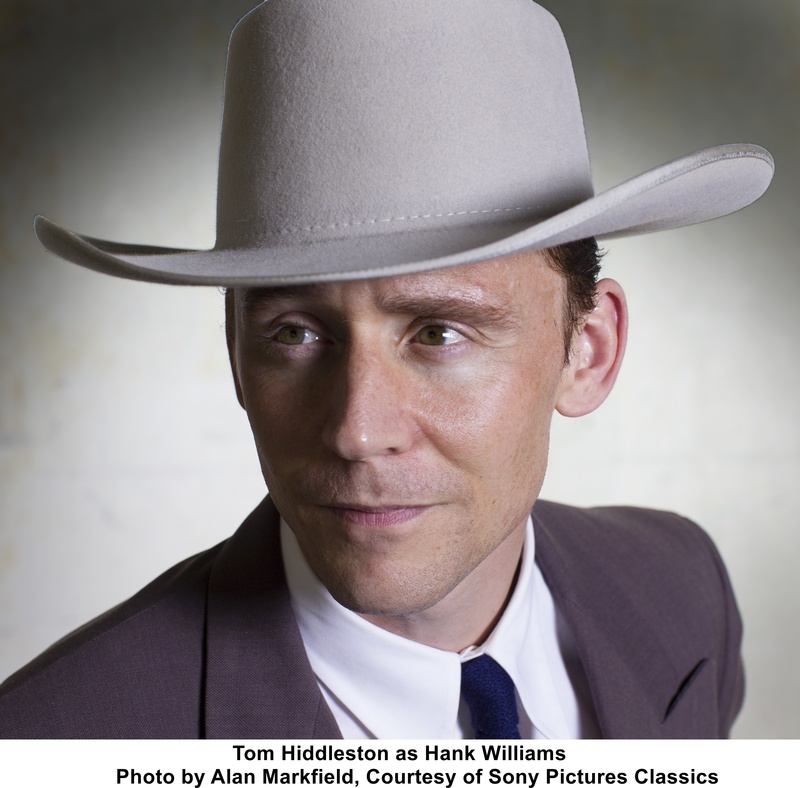 Tom Hiddleston certainly looks every inch the part in this still, the first Sony Pictures Classics has released from I Saw the Light, Marc Abraham’s Hank Williams biopic. Singer/songwriter Rodney Crowell plays Williams’ dad Elonzo. More importantly, Crowell is also the film’s executive music producer and the person charged with transforming the Brit actor into an American legend. They were in the process of that when Hiddleston joined Crowell on stage last September at the Wheatland Music Festival to sing “Move It on Over” in a performance that augers well for a film that ought to have a lot of people seeing the light.